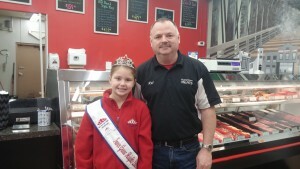 On Tuesday January 19th I visited with my sponsor, Rob, from Hometown Meats. We talked about how the first few months of being Little Miss Princess of IGH has been for me, so much fun of course! I told him about the fun activities my royal sisters and I have been doing and about helping out at different events out in the community. We talked about how the holidays is a very busy time for Hometown Meats selling a lot of delicious kinds of meat like steaks, bacon wrapped chicken and other snacks. The beef sticks are very popular but I have to say if you want to try something new try the peanut butter bacon burgers…. they are awesome! !